When it comes to applying a sign flood light or other exterior building lighting effectively, precision is often in the details. 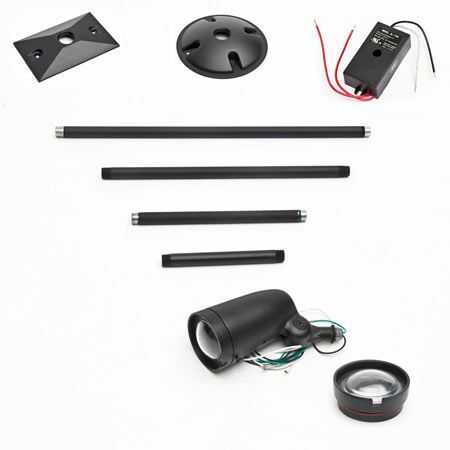 Sign light accessories from Sign Bracket Store ensure that each outdoor sign flood light fixture enjoys optimal installation and trajectory of light for a mastery of all components. Beginning with various arm extensions for sign flood light fixtures, this category of sign light accessories includes extenders in various sizes and also the corresponding couplings for such a spot or flood light installation. By mounting an outdoor sign flood light fixture on an extender, illuminators can be placed at a prime distance from walls, signs or monument faces. Other sign light accessories include cover plates, bullet light glass lens covers, ground stake electrical floodlight mounting and sign light pedestals. For attractively efficient spot or flood light installation, find accessories online at Sign Bracket Store. For questions on any of our Flood/Spot Lighting Installation Accessories, please call 1-888-919-7446 (M-F, 7am-5pm PST). Sign light accessories are key for projects requiring an outdoor sign flood light fixture that exudes brilliance - both literally and figuratively. At Sign Bracket Store, we recognize that exterior building lighting and sign lighting fixtures help to make up the face of your business. Consequently, a sign flood light or spot light installation should make a first impression that parallels a firm handshake. Sign light accessories help to achieve that effect. To mount a sign flood light at an optimal distance from signs or targeted areas, arm extensions for sign flood lights are an efficient modifier. Available in various sizes, our aluminum and galvanized steel arm extensions for sign lighting fixtures are designed to strategically maneuver your sign, spot or flood light installation and achieve a flawless trajectory of light. When mounting an outdoor sign flood light fixture using arm extensions, couplings are also required. Accordingly, our Flood and Spot Light Installation Accessories category also includes couplings to accompany extender arms. Other sign light accessories found here include glass lens covers for bullet sign lighting fixtures, cover plates for arm extensions, pedestal mounts for sign lighting fixtures and ground stake electrical flood light mounting. A 105W Transformer is also included for 12V low voltage bullet lights to ensure compatibility with end user electrical systems. Beyond accessories, exterior building lighting featured on our website includes everything from sign flood lights to sign lighting fixtures on gooseneck arms. Accessories found in the above category primarily coincide with spot and flood light installation to ensure light reaches a targeted area. Sign flood lights and spot lights are primarily utilitarian in nature, but Sign Bracket Store also offers sign lighting fixtures that are aesthetically driven in our Gooseneck Lighting collection. For questions on any of the products seen online, or to discuss your exterior building lighting project in more detail, please call to speak with one of our knowledgeable project managers: 1-888-919-7446 (M-F, 7am-5pm PST).